The only non-invasive radio frequency and ultrasound technology for body contouring and skin tightening. Exilis Ultra™ is an FDA approved, advanced nonsurgical method of firming and tightening skin and body tissues, as well as reducing excess fat. The primary cosmetic benefits of Exilis Ultra are firming the skin, reducing excess fat and creating visible tightening for a more youthful appearance. Exilis Ultra treatments at Charmed Medispa are customized for each individual patient, as the handheld device is versatile enough to easily treat any area of the body. It can be controlled to treat the surface of the skin to achieve skin tightening, target the deeper tissues for fat reduction and collagen stimulation, or a combination of the two. The Exilis device also contains a cooling mechanism for the safe transmission of radio frequency energy. This allows it to cool the epidermis and prevent surface damage while still causing the disruption of fat cells. Exilis Ultra treatments are pain-free with no downtime. In fact, it can give you a red carpet ready look the same day. Our clients return to their daily activities immediately following treatment, without the need for downtime or a recovery period. Makeup can be worn immediately after treatment with Exilis Ultra. Sculptra to the jaw chin line and smile lines. Notice the crepey skin improvement and lift. Exilis Ultra™ uses both radiofrequency and ultrasound energy to heat up the deep layers of the skin. This causes the fat cells to shrink and the body to regenerate new collagen. The fresh collagen improves the skin’s tone and texture. Gradually, the skin begins to look healthier and younger. Exilis Ultra treatments can be safely used anywhere on the face or body, including the neck, trunk, arms or legs. It is commonly used to tighten skin around the eyes/brow line, on the mid-face, jawline, neck, abdomen and upper arms. Exilis Ultra helps to define the jaw chin line and improves crepey looking skin around the face and eyes. Exilis Ultra treatments are performed in our office. Anesthesia is not needed. Treatment takes 30 minutes for small areas and up to an hour or more for other areas. Our guests like how the treatment feels and also like the instant glow they get after Exilis Ultra treatments. Exilis Ultra™ stands out as a treatment not only because it has excellent results, but because it can be used for many and varied skin and body issues. In addition, our providers have over a decade of experience using this technology and are very skilled at providing a superior treatment with results that are unparalleled in Delaware. Our med spa providers are also very careful to pick clients who would be good candidates and this is key to a successful outcome. If you have too much skin or looseness, we will not perform Exilis Ultra. We thrive on making sure our recommendations for skin tightening with Exilis Ultra will have safe and reliable results. Virtually any area on the body or face can be targeted. It is effective on all skin tones and safe for an exceptionally wide age range. Exilis Ultra is a painless, cost-effective alternative to surgery, and is more efficient than other nonsurgical heat-based interventions that rely on radiofrequency emissions alone. The additional ultrasound element allows for a faster rise to therapeutic temperatures, facilitating rapid treatment, increased comfort, and better control over the results. One of the most common areas of Exilis Ultra treatments is the lower face and neck area. 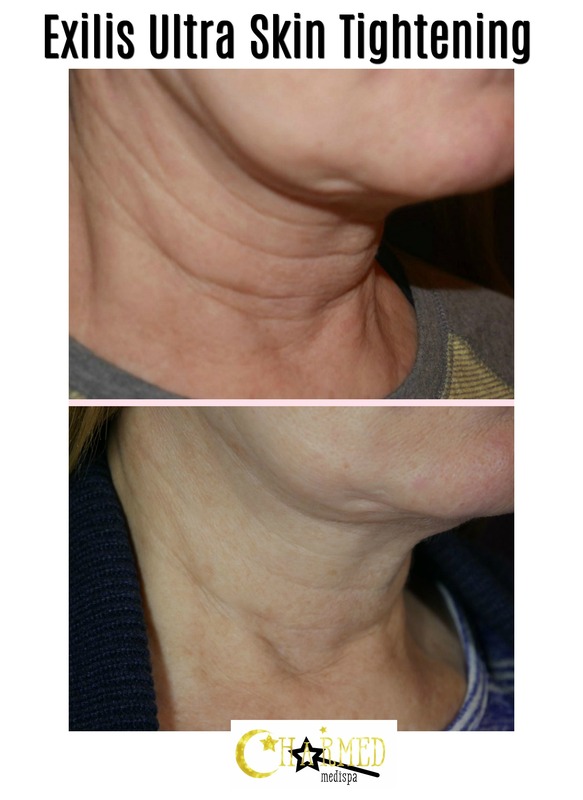 Exilis Ultra to the face and neck can help to lift and contour the face without injections or surgery. Exilis Ultra around the eyes is also very popular for the fine lines and wrinkles. WHO IS THE RIGHT CANDIDATE FOR EXILIS ULTRA™? Exilia Ultra is ideal for any person looking for cosmetic improvement with skin tightening and stimulation of collagen on their face and body. Common areas of treatment include the eye area, around the mouth, chin area, jaw line, décolleté, arms, legs and knees. Crepey skin is one of the most common concerns our med spa guests want to improve and Exilis Ultra is an exceptional option to smooth and tighten the skin. Exilis Ultra meets strict safety standards. The embedded Energy Flow Control system ensures that the exact amount of energy is delivered during the treatment. Exilis Ultra has integrated cooling allowing your experienced provider to target heat to proper skin depth to achieve the best results, while maintaining your comfort. The safety and efficacy of the therapy have been thoroughly tested in several clinical studies. Charmed Medispa will tailor the best treatment plan based on your individual needs. Most patients undergo 4-6 Exilis Ultra treatments, scheduled on a weekly basis. Each treatment of a specific body part usually takes between 30 – 60 minutes. This can vary depending on the treated area, treated indication, and other factors. In addition, we can assure you that we pick guests who are good candidates and if there is too much loose tissue our med spa will not perform Exilis Ultra and will guide you on more appropriate treatments options to ensure your satisfaction. Having experienced Exilis Ultra providers such as Charmed Medispa has ensures that you will get an honest plan for your concern and that your treatments will be done in an exceptional fashion. The key is picking the right person with the right number of treatments and having the right provider perform the service. We assure you that all of these factors are considered for Exilis Ultra treatments at Charmed Medispa. No, in fact, most of our guests love how it feels. Exilis Ultra treatment should not be painful. Exilis Ultra provides the most advanced non-surgical solution, treating your face, body and intimate parts safely, efficiently and without pain. Most patients describe the sensation of the therapy as being comparable to that of a pain-free, hot stone massage. The treatment is performed in a lying position so you can easily relax during the procedure. Clients in many clinical studies have reported excellent clinical outcomes using Exilis Ultra. The key to results is making sure that this is the right technology to use for your specific concern as well as the right number of treatments performed. In addition, our provider provides a more superior treatment with Exilis Ultra which leads to a more superior result than other providers. It is critical to understand that Exilis Ultra treatments are very individualized and should therefore be very customized. Browse our Before & After photos to see some of the results. You can expect tighter, firmer skin with collagen stimulation that continues to improve for months after your last Exilis Ultra treatment. Having no downtime is the beauty of Exilis Ultra treatments. The whole Exilis Ultra procedure is non-invasive and requires no recovery time. You can easily have the treatment during your lunch break and return to your daily activities immediately. You can even go home to your spouse and they will never know either! 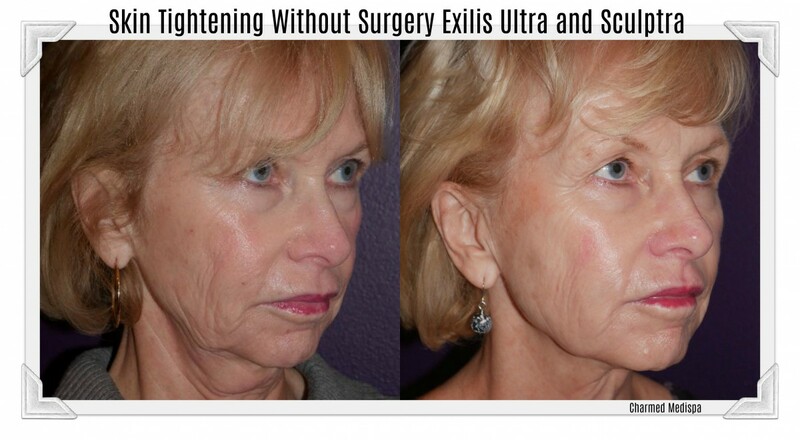 Skin tightening can be done on the sly with Exilis Ultra. This very much depends on the treated area, its condition and other factors. You may see visible improvements after a few sessions. Results will typically improve over a 3-month follow up period after your last treatment. Final results with Exilis Ultra are typically seen about 3-6 months after your treatments have stopped. In addition, we recommend maintenance Exilis Ultra treatments to keep as well as enhance your results. Our guests love the skin tightening they get from Exilis and that they can keep those results with success. WILL I NEED TO CHANGE MY LIFESTYLE, DIET OR SKIN CARE ROUTINE? You will not be required to exercise or alter your dietary habits. Your skin care does not even need to be modified to have Exilis Ultra treatments. However, the treatment results can give you a head start to a better looking face or body. Many patients feel motivated to take care of themselves better when the procedure is over. WHAT SETS EXILIS ULTRA™ APART? Many years of research and development have resulted in the only device of its kind that simultaneously applies the two very popular energies: radiofrequency with ultrasound. The combination ensures high patient satisfaction and comfort. Thanks to its built-in cooling, Exilis Ultra offers pain-free and safe therapy, able to precisely and efficiently target the desired tissue of the face or body. Our Exilis Ultra results are apart from others! Our Exilis Ultra technique and the way we perform treatment is the best in Delaware. Our med spa has the most experienced Exilis Ultra providers. We encourage you to experience the difference our providers will make in the outcome of your results and your overall experience. The technological combination of ultrasound and radio frequencies delivers ultra-effective results from a non-invasive device. You will not need anesthesia or recovery time. Many patients compare the therapeutic procedure to receiving a hot stone massage. Independent, nonpartisan studies demonstrate that exposure to Exilis Ultra causes tightening of the skin and speeds the reduction of fat cells. Integrated technology provides controlled cooling and temperature monitoring, so you can relax during this no-stress procedure. Ultra Possibilities … Ultra Results!